As a special treat–AMAZING author/illustrator Debbie Ohi not only read and reviewed the book (I’m a longtime horror fan, and this was right up my alley😉 but also created this FAB fan art!! I’m absolutely thrilled with the response of reviewers so far. I set out to write a creepy little story that would give readers a few chills and leave them with something to think about. I hope I’ve hit my mark. 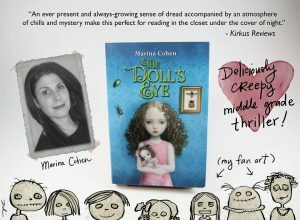 « THE DOLL’S EYE COVER REVEAL!